The Town of Odyssey • View topic - Which one do you hear? Which one do you hear? Post subject: Which one do you hear? When you listen to this clip, do you hear "Yanny" or "Laurel"? I'm sure just about everyone has seen (or more accurately, heard) this by now, but I'm curious to find out what everyone hears. I'll leave bookworm to explain the sciency stuff if he so chooses, but if it's been driving you crazy, this tool actually helps you hear both words. I personally can hear both; Laurel is a little more difficult to catch, but I hear "Yanny" so clearly that I don't understand how anyone could not hear it. Post subject: Re: Which one do you hear? In the standard one, I don't hear anything but laurel. Even with the helper tool, I don't hear anything different until it's about two or three steps out from the extreme end, and then it doesn't sound like "Yanny", but Yerry. I heard Yanny the first time, and then Yuri the second time. I don't want to listen any more because I don't want to hear yet another option! There's a Laurel St. in my city, and someone taped "YANNY ST." under it. Haha, it's crazy how these silly things consume the internet! That's pretty good. Yanny is what I hear, though I heard Laurel once. People are taking about it everywhere. It’s kinda hilarious. But this thing is just (basically) two words superimposed with one being higher and the other being lower, so you can mostly one focus on one at a time. But check out this witchcraft. I keep seeing some Twitter poll being touted that says a slight majority hear "laurel," but nearly everyone I've talked to in person and in topics like this and on other forums I visit about it, Yanny is the run-away winner. Could Twitter polling not be 100% accurate!? Thanks for posting about this Petrichor, I'd seen headlines mentioning it for a few days but never clicked the articles because none were clear on what it was actually about so I actually hadn't heard about this yet. So it's like The Dress but an aural phenomenon rather than visual. Fascinating! Though I think the dress photo is more sensational because it's crazy that we can't trust something we're looking right at, while we know it can be pretty easy to hear things wrong especially if it's just from sole audio with no context aids, but this is still really interesting because the two things people hear are so different. It comes down to how our brains pick up on, and interpret, different frequencies. 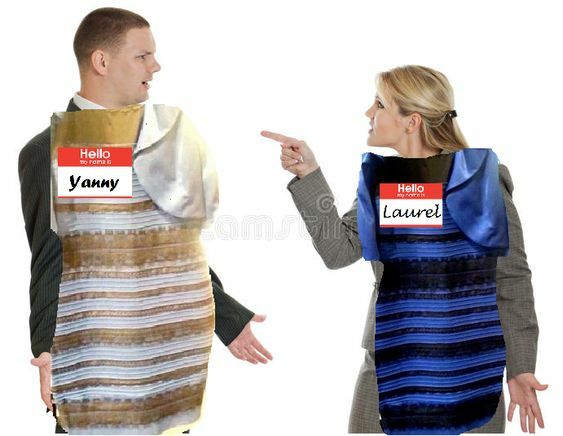 The audio version of “the dress” cleaved the internet, and likely your family, your friends, or your office, into two bitterly divided camps on Tuesday: the Laurels and the Yannys. It began, as it so often does, with a viral clip posted by a high schooler on Reddit, which blew up when Cloe Feldman, a YouTuber and social media influencer, added it to her Instagram story and then to Twitter, asking, “What do you hear?! Yanny or Laurel.” Using that slider tool I start hearing Yanny as soon as it's moved any amount to the right, but in the original audio it's Laurel every time. So what’s going on here? The clip is playing around with frequency — and it depends on the range of frequencies listeners hear. “There’s just enough ambiguity in this fairly low-quality recording that [some] people are hearing it one way and some people are hearing it another,” Brad Story, the associate department head of speech, language, and hearing sciences at Arizona State University, told me. “So when you’re listening to ‘Laurel,’ the reason you get L, R, and L is because of the movement of that third frequency,” he said. Here’s the catch. The word “Yanny,” the second frequency, has almost exactly the same pattern as the L, R, L in “Laurel,” he added. One reason for the confusion is the poor quality of the recording. “Typically, if you have a high-quality recording and you’re listening on a good device of some sort, you’re not ever going to be confused by those,” Story said. So if you’re hearing “Laurel,” you’re likely picking up on the lower frequency. If you hear “Yanny,” you’re picking up on the higher frequency. It really comes down to how our brains pick up on and interpret these frequencies, Rory Turnbull, a professor of linguistics at the University of Hawaii, said. Video game developer Dylan Bennett made a video that illustrates what’s going on here. People might be able to focus on the higher frequencies — the Yannys among us — because they have really great headphones or very good hearing, Benjamin Munson, a professor of speech, language, and hearing sciences at the University of Minnesota, suggested. “But for the rest of us with po’folk headphones and old-folk hearing, we just hear the lowest-frequency components,” he wrote in an email. But maybe don’t panic too much about your hearing if you’re on Team Laurel. One likely source of the confusion is the clip itself, which doesn’t correspond to the sounds humans generally make when they’re speaking. This is a spectrogram (a visual representation of those frequencies) of the “Laurel versus Yanny” meme. The dark bands represent what are known as “formants,” the frequencies that resonate the loudest. Vowels pronounced by humans have multiple formants, but the first two formants (F1 and F2) are crucial to determining what the vowel sounds like — such as whether you’re making an “eee” sound or an “ooo” sound. “I heard the higher-frequency formant sequences when I first listened to this signal two hours ago and thought that they maybe were someone talking in the background. Then I thought ERMERGERD, IT’S THE AUDIO VERSION OF THE RING,” Munson joked. There isn’t actually another voice in there, he said. It’s just the lower-frequency patterns repeated at a higher frequency. Again, that mismatch — or “shenanigans,” as Munson called it — doesn’t happen with human speech. Why this is going on in the Laurel/Yanny clip is less clear. “One possibility is that the formant pattern at the higher frequencies is just ‘Laurel’ transposed to higher frequencies, and that ‘Laurel’ sounds like [‘Yanny’] at higher frequencies,” Munson wrote. Another guess is that “Laurel” and “Yanny” got smashed together. But all this confusion — those so-called “shenanigans” — forces our brains to fill in the blanks of how the clip should sound. It’s possible that knowing there are two choices — “Laurel” and “Yanny” — preps us to hear one or the other distinctly. Or listeners could be affected by the language they speak, or the last thing they were listening to before they clicked on the meme. I hear Laurel, loud and clear, not ambiguous at all. I would never think anyone could hear anything else from that clip, especially not something so different as Yanny! Crazy stuff! Using that slider tool I start hearing Yanny as soon as it's moved any amount to the right, but in the original audio it's Laurel every time.